Apologies. I got gusted up in the fall breeze and dropped in the middle of the brussel sprout harvest on a coastal California farm where I went on an unchecked pie-baking spree. The leaves fell and I was whisked home in time to move all my worldly possessions to yet another house before I was utterly incapacitated by the generous gift of a lovely old sewing machine. I spent days engrossed in anachronistic craftiness before I looked up in the middle of threading the bobbin to realize I hadn't yet unpacked so much as a sock. So I busied myself bulding a cozy fort in the basement nook that was to be my room, and before I even caught my breath it was time to bake a birthday cake. I don't generally like cake. I like pies and cookies -- moist, rich, chewy things, not dry overly-sweet crumbly things. I was mulling over the cake problem as I chewed thoughtfully on a chunk of ginger root one morning (ginger is a stimulating and salutary habit I've recently developed). 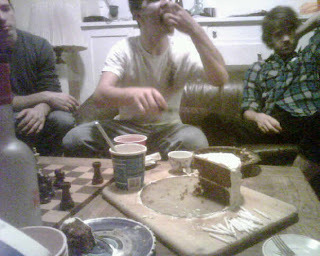 And suddenly I knew the cake I wanted, its flavor and texture wafted to me on the golden wings of a ginger-dream. Prep: Set out 16 eggs, two and a quarter pounds (9 sticks) of unsalted butter, and a quart of soured milk (or fresh milk + 2 T. vinegar). Butter and flour two 9 or 10" cake pans (2" deep, at least) and a 9 x 13" baking dish. I have a woefully underequipped kitchen, aside from my cast iron treasures; so I used my glass-bottomed springform pan and the old #9 skillet. Preheat the oven to 350 degrees Fahrenheit. In one very large bowl, whisk together 8 c. all-purpose flour, 3 tsp. baking soda, 4 tsp. salt, 2 T. ground cinnamon, 1.5 T. ground ginger (I ran out and had to use part fresh ginger, which worked fine), 1 tsp. ground cloves, and 2 c. oat bran. Yes, bran. Not because birthday cake should be healthy -- because that's silly -- but because it should be moist and chewy. Moist chewiness is the particular province of oat bran, not wheat or others, so don't substitute. In another large bowl, cream 1 lb. butter and add 10 eggs, 3 c. molasses, and 1 qt. sour milk. Add the liquids to the dries, mix it all thoroughly but not excessively, pour the batter into the pans and spread it evenly. Bake about 45 minutes, till a knife comes out clean. The cake can sit out, covered with plates or plastic, for a day at least, and stays plenty moist. When the cakes are entirely cool, loosen them from the pan-sides, invert the pans onto a cookie sheet, and rap them smartly till the cakes fall out. Trim off any unevenness and make the skillet-cake a little smaller and straight-sided. They are ready to frost and serve. This buttercream can be prepared a few days in advance or just before use. Since the ingredients are so few, the honey must be exquisite and the butter perfect. Bring 1" of water to a simmer in a large, deep skillet. Separate the remaining six eggs, stashing the yolks in the fridge for custard or somesuch and keeping the whites in a metal bowl. Add 1 c. honey, and maybe a pinch of cream of tartar if you have it on hand (I didn't). Whisk till well-blended. Place the metal bowl in the skillet of water and immediately start beating it - at first on low, gradually raising the speed as the whites fluff. When the whites are glossy and form soft, curled peaks, remove the bowl from the heat but continute beating till the whites have cooled a bit (3 minutes or so). Beat in 1 tsp. vanilla and 1/2 tsp. salt. In another large bowl, beat 5 sticks butter till fluffy and creamy. Add the egg white-honey mixture incrementally to the butter, beating thoroughly between additions. Now it is time for the ginger. I am still not exactly certain how much ground ginger I added, but I'll wager it was at least a tablespoon, and maybe two. The issue here is that the butter mellows out the ginger bite -- so you'll have to add more than you think you should. Taste and adjust, taste and adjust. You should have a fluffy frosting that sweeps in with a rich honey-butteriness and finishes with a warm ginger zing. Pack the cakes in your backpack (they're sturdy; they'll be fine!) along with the frosting and bike 20 blocks to the birthday house. Assemble the cake on site just like in the picture. 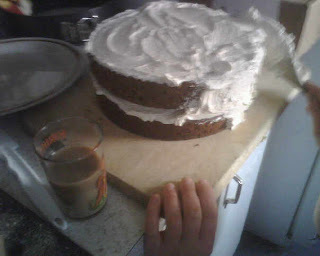 There will be just enough frosting for the two round layers and the back-up 9 x 13" cake, provided you don't eat too much in the process.